Have fun with your students on April Fool's Day. Give them a copy of the animal word search (with no animal words in it). 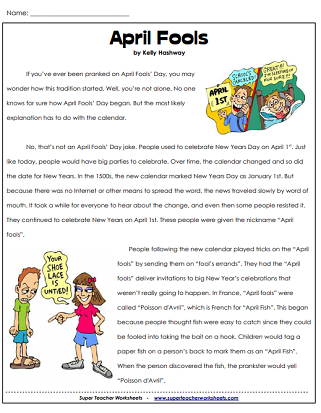 Or, read about the history of April Fools with the reading comprehension passage. 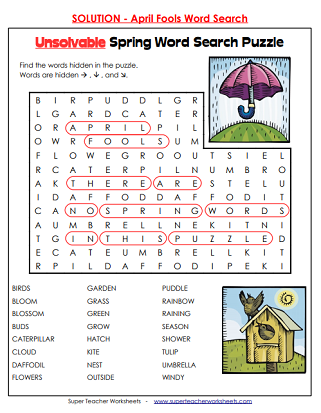 Have your kids find the animal words in hidden in the word search puzzle. (Of course, there are no animal words in the puzzle! April Fool!) This puzzle is not solvable. Watch your students search and search for words that aren't there. Your students won't be able to find the words hidden in this word search. Why? Because they're not in the puzzle at all! If you're feeling a little devious, hand out copies of this puzzle to your class. Learn all about the history of April Fool's Day around the word. Spring has brought with it many surprises! The biggest surprise of all is an April Fool's Day joke! 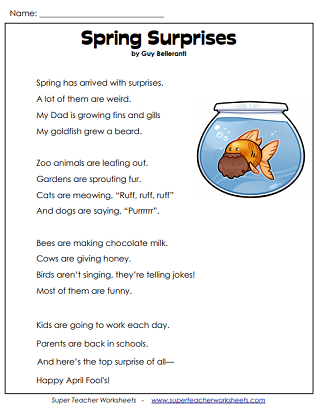 Poem includes reading comprehension questions, vocabulary words, and a writing prompt. We have thousands of holiday worksheets, crafts, and activities for your classroom. Holidays include: Pi Day, Dr. Seuss' Birthday, Christmas, Thanksgiving, and more!